Hi decided to change the subject line. See the attached. I made these Spads better than ten years ago but never tired them. They fit in the fixture where the aileron balance weights go. Even drilled them to allow (I think) for the wing tip vortex. Was going to try one on one side first so if it snatched or ripped something off the plane I might still have aileron control. Then I got concerned and never went any further. You might have had a problem testing with one spade. If I decided to take on that task I'd do it with two. Seems to me the spades need to balanced. One spade would be severely out of balance, nothing to counteract the single spade except stick force. Might be a hand full. I have mostly been enjoying other people's posts and staying quiet but decided there was enough safety issue here to comment. I was an F-106 and A-10 driver years ago and went on to a career in NASA spacecraft design. But my passion is aviation, and especially low and slow like Kolbs. As part of that I built an original Firestar and later owned a Mark3X. Loved them both but made a point to learn a lot about them too. Spades obviously lighten stick forces by adding aerodynamic balancing. They do this by digging in to the wind on the "other" side of the aileron hinge from what the pilot input is doing. This helps you deflect the aileron. And yes, Kolbs do have heavy ailerons, especially that M3X with flaperons. But Kolbs are very unusual in a very important way. The ailerons are heavy because they have lots of area with no aerodynamic balance. If the aileron structure were rigid, they would feel even heavier. That is because much of the movement you have in your stick comes from the aileron spar bending and twisting. I used to be amazed that even with a bunch of stick input on the M3 the tip of the aileron hardly moved at all. 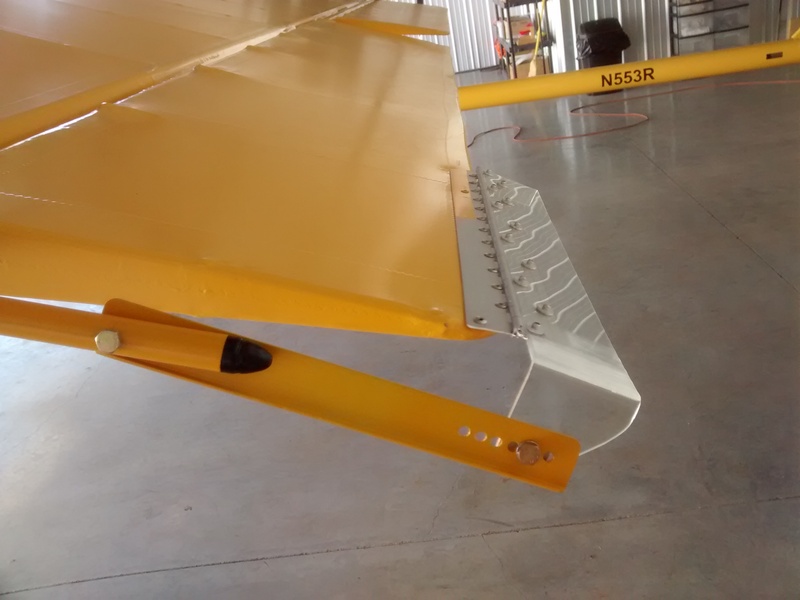 But what really got my attention was when I would stand at the wingtip and twist the aileron with the mass balance and see how easy it was to move it 3 or 4 inches after the stick had hit the stops. This is not what I consider to be a safety issue because that big aileron is trying to stay streamlined and will not do anything funny (assuming you have mass balanced the faster ones), but it is unusual in aircraft design. Now imagine that you have a spade out there on the end so that instead of the aileron spar bending against the predictable resistance of that big aileron there was a spade applying a booster force. I assume that with small spades like in the picture installed symmetrically the handling would not change too much, but it might. And if you did put just one on the aileron on that side would deflect much further both directions and could really mess with the handling. I love Kolbs which is why I read this list all of the time. And I would like all of you to enjoy them safely. Jim what about spades mounted at mid aileron? It seems to me that the spade will reduce the amount of strain and deformation of the aileron system components. A-10 driver years ago and went on to a career in NASA spacecraft design. them both but made a point to learn a lot about them too. Spades obviously lighten stick forces by adding aerodynamic balancing. really mess with the handling. like all of you to enjoy them safely. > You might have had a problem testing with one spade. > If I decided to take on that task I'd do it with two. > of balance, nothing to counteract the single spade except stick force. > Might be a hand full. > concerned and never went any further. >A-10 driver years ago and went on to a career in NASA spacecraft design. >them both but made a point to learn a lot about them too. >Spades obviously lighten stick forces by adding aerodynamic balancing. >really mess with the handling. >like all of you to enjoy them safely. >> You might have had a problem testing with one spade. >> If I decided to take on that task I'd do it with two. >> of balance, nothing to counteract the single spade except stick force. >> Might be a hand full. >> concerned and never went any further. Why have spades at all? Neither are a necessary mod. I put VGs on my MKIII after I flew it 3400 hours for the past 34 years. Then I got an itch to give them a shot. I did not need them to comfortably fly my aircraft. It was a novelty to give them a try. Yep, they helped a little. I could fly a few mph slower, and best of all VGs did help clean up my full stall landings. At my age I was not as sharp as I once was, and found myself occasionally screwing up my landings. I didn't need them but they did improve an already good handling airplane. I got mine from John Gilpin, STOL Speed VGs. You can also order them from Aircraft Spruce. What started this thread was a very low time Kolb pilot and builder. I think he has less than an hour flight time already. This is the same guy that initially came on the List denigrating Kolb's elevator hinge system. Had to go get an aerodynamic engineer to tell thousands of us Kolb pilots and builders that we were doing it wrong, not the way the book dictated. So...we've flown thousands of hours without losing a single elevator, yet we are flying in an unsafe condition according to these experts. Now...Bill Berle has flown his FS 20 minutes and he wants to redesign it because it does not fly the way he wants it to. Kolbs fly like Kolbs. That is one of the things that make them a unique aircraft, one that I have flown for many years. The reason I have stuck strictly to Kolbs is because I love them, the way they fly, the way they look, and best of all their superior crash worthiness. Maybe one of these days some of you all will be able to experience Kolb's crashworthiness first hand. I sincerely hope not. I too complained to Homer Kolb many, many years ago about his heavy ailerons. I thought they should be light like a rotary wing cyclic, the aircraft I had some experience flying. Homer told me to be gentle with the Kolb and it would do just what you wanted it to do. Homer was absolutely correct. Imagine that. I've learned to use Homer's advice and have been privileged to fly in some pretty exciting places in some pretty exciting weather. I don't ever recall wishing I had spades to get me out of any situation. I didn't need them to get me home. OK...something to think about when you're screwing with Kolb ailerons. Kolbs will not fly very long without aileron control. 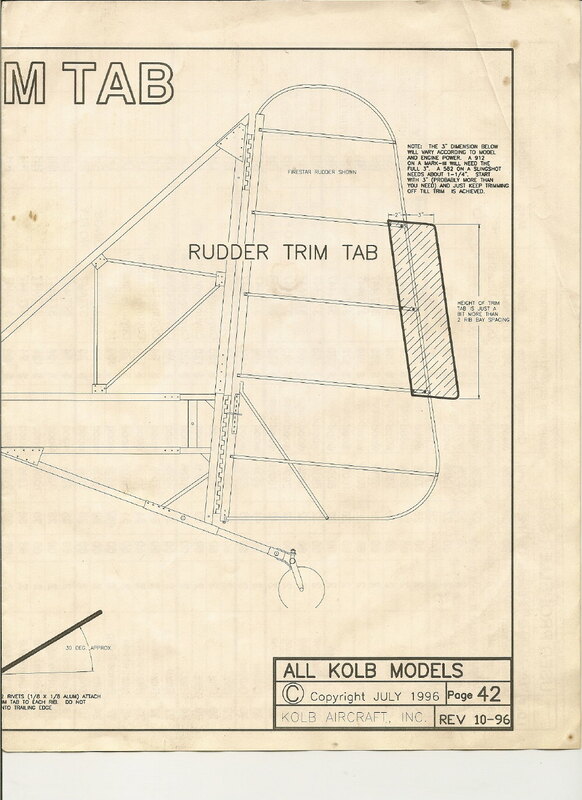 If you don't believe me, try to fly your Kolb with the ailerons locked, using rudder and elevator only. Those that put a bunch of dihedral in the wings can probably toot around all day flying without aileron input, but the plans built and rigged Kolbs won't. They'll maintain heading for a bit and then roll over and dive to the ground. Your rudder and elevators can't get you out of that situation. They will fly with one aileron. We've had folks lose aileron control on a single aileron. If Bill B wants nice light aileron control and can come up with safe, workable spades, that is fine with me. I am not trying to encourage Bill to stop his experimentation. That's what it is all about, but I prefer to fly my MKIII just the way it is without them. The above are my thoughts and opinions only. Not intended to influence anyone. I don't encourage anyone to do stuff the way I do it. Well I'm trying to be much more reserved in my comments, and trying to not make anyone too upset, and trying to thank others for offering their opinions whether they agree with mine or not. Worked pretty well for a while. I am really sorry if it rubs people the wrong way when I question something. The Kolb factory has incorporated a lot of changes and improvements and modifications to Homer Kolb's original designs. Many of those modifications and changes happened because of ideas and creativity from some of the people on this Kolb List. I hope it's still OK to think like that. This morning was the third 20-25 minute test flight on my Firestar. I had raised the leading edge of the stabilizer by 3/4 of an inch since the last flight, and this change significantly reduced the amount of forward pressure needed on the stick. But the aircraft still did not fly in a manner where I felt I could actually let go of the stick. It would have gone nose-up immediately. I spent the day today making slightly bigger (and better quality) extensions for the stabilizer mounting. The leading edge is now a shade over one inch higher than it had originally been. On the pre-takeoff runup the "mag check" showed a very significant drop on one ignition system. Since the other system was plenty strong and I was staying directly over the runway, I decided to take off (and stay immediately over the airport). But after landing I did additional ignition checks which showed that there is something improper going on with one of the ignition systems. This needs to be sorted out before the next flight. Now...Bill Berle has flown his FS 20 minutes and he wants to redesign it because it does not fly the way he wants it to. Kolbs fly like Kolbs. all will be able to experience Kolb's crashworthiness first hand. I sincerely hope not. Just a suggestion. Why not take a few minutes, droop the ailerons a couple turns, test fly, and see the results. When I got up this morning that's what I was thinking. It's a simple exercise, a proven exercise to help correct adverse pitch. If that doesn't work or you don't like it, it's simple to put things back where they were. How high are you now above the plans indicated rigging of the leading edge of the horizontal stabilizers? Looking at longer main gear and high pusher prop, one would think you would have a pitch down problem rather than a pitch up problem. How much do you weigh? Got me scratching my head. I apologize if I don't own a "pair of kid gloves. Something else I thought of that gave me problems was the inboard rib attachments to the elevator leading edge tube. The cord of the elevator is longest here and has the most stress. The plans called for a single 1/8 X 1/2" pop rivet to attach to the leading edge tube. Didn't take a lot of hours for that rivet on both elevators to start loosening up. First time I drilled out the rivet without destroying the rib tube or leading edge. When that one loosened up I attached a triangular 6061 gusset top and bottom. riveted it right over paint and fabric. If I built another one, I'd fix it before covering. Over many hours the same thing was happening to the rudder. Ribs attached same way. Mine loosened up at the bottom rib. Applied the same fix both sides. Glad to see you have another flight under your belt. I absolutely agree that the big tires, long gear legs, and high thrustline SHOULD have given the aircraft a nose down tendency. I was actually surprised that it was the opposite. We did a weight and balance and found that the empty weight was well within the CG range shown on the 1993 version of the plans. With full fuel and a 10 pound PC545 battery it was a little toward the rear of the CG rancge, but still reasonably within that range. I will get these numbers from my engineer ASAP and post them. One of the big questions I had at that point was that the CG range on the plans was the widest acceptable CG range I have ever seen on any aircraft over 40 years of owning and flying airplanes, R/C model airplanes, and being an amateur student of aircraft design. 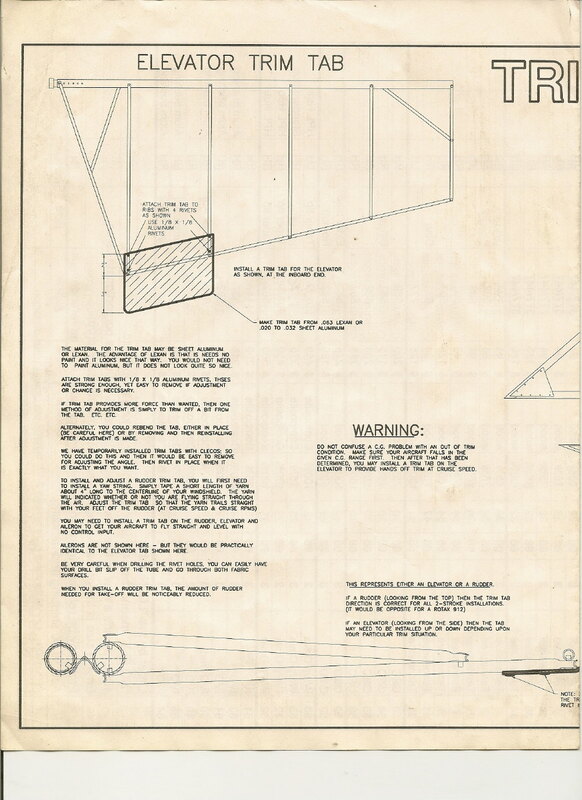 If I recall, it is printed on the plans clearly that the CG range can be something like 20 to 43% of the wing chord. 25 to 33% is considered "normal"as far as I have learned. I was fortunate enough to have a highly trained and experienced person supervising the W&B process. I made up a 9 degree wood wedge with a bubble level on it to put under the wing, to achieve a level condition. We had digital scales, not bathroom scales, on all three wheels. At that time, I stood on the scale and weighed 228 with clothes and shoes. (This is a miracle in itself, I had lost a fair bit of weight, and am still losing weight slowly thanks to better eating habits). I may be 200-210 at present. All test flights so far have been with 50% to 70% (approx) fuel on board. No flights have been made with the tanks completely full. The HKS engine was mounted as low as possible on the airframe to minimize the high thrust line problem. The engine is on 2 inch aluminum risers, and the risers are on a 3/8 inch thick aluminum plate, and that plate is directly on the stock Kolb rubber mounts .NO angles, shims, or wedges were installed to offset the thrust line left/right or up/down. It is pushing at whatever angle Kolb built in to the fuselage mount. I did not build this airplane originally, so I do not know whether it had been built with the stock plans location for the front of the stabilizer. 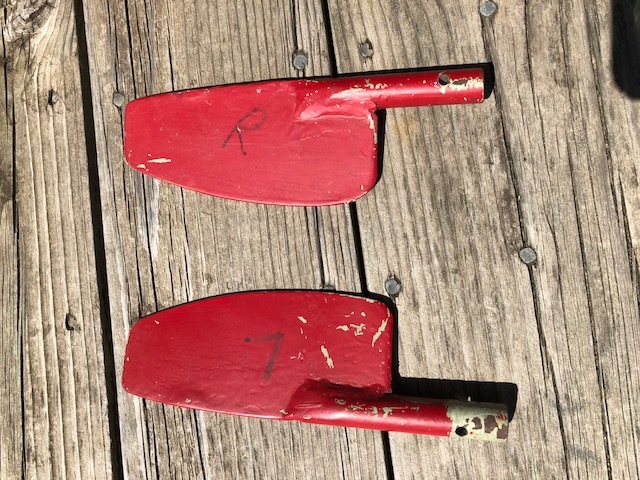 What I do know is that it LOOKS like the little welded Kolb stabilizer brackets were riveted onto the fuselage tube a little higher on the fuselage tube than they were intended. I say this because (looking from the front view) the vertical steel tabs welded on these fittings are not vertical, they are angled "towards each other" a few degrees at the top where the bolt goes through. I will try to take a picture today of the stabilizer mounts and post it later to the List. Drooping the ailerons makes perfect sense in one area, but it coule create a potential problem in another area. The majority of light, non-aerobatic aircraft in the world have a few degrees of twist in the wing. We old model airplane builders call it "wash-out", but there is probably a fancy scientific name for it. This makes it so the inboard root end of the wing stalls first, and leaves the uter half of the wing still flying until the last moment. This is there to prevent the airplane from rolling to one side or trying to spin when it is stalled. Ifyou have an airplane where the outer part of the wing is at a HIGHER angle than the inboard root end, then the opposite happens. The outer haf of the wing stalls first. This is a much less safe condition. Drooping the ailerons too far would be going in this direction. Now if the ailerons were flexing UPWARD in flight because of the air loads, and adjusting the rod ends would bring them down to LEVEL with the wing, then this would likely not cause that problem. But my issue is that I have not been able to measure that accurately yet. So I am not yet in the positiont o gauge whether I would be correcting the problem (LEVEL ailerons) or making a new problem (LOWERED ailerons). I'm trying to be as conservative and careful as I can within reason. But now that it has been mentioned I will make a point to see whether the ailerons are level, up, or down in flight. Screwing in the rod ends would be a very WELCOME solution, it's a lot less time and effort than making stabilizer extensions! you weigh? Got me scratching my head. same way. Mine loosened up at the bottom rib. Applied the same fix both sides. stick. It would have gone nose-up immediately. Drooping ailerons on a Kolb will not create a potential problem. If it did, we'd be seeing a lot of Kolbs equipped with Flaperons crashing. Will it cure your problem. I have no idea, but you won't know if you don't try. I'm not trying to offend anyone by giving my opinion. Dropping the ailerons together will work as trim. Here is another way that will work, your choice. See print attachments. The problems I have found with Rotax CDI's is that people crank the engine with the secondary's not on a grounded spark plug. That will ruin the output coil and they are $700 new. (I ran a compression check with the plugs out).Another thing is people supply 12 volts to the CDI's. The CDI's will operate no matter what until the ignition leads are grounded to stop the magneto section. Check to see how your ignition switch is wired. You have one system failed but the other still works. Some people run the 670 snowmobile engine with single ignition but 100 hp, your choice. On the good side, I have never talked to a dealer say he saw a failure if you don't crank them with the secondary not grounded. The redundant ignition comes from mags having points, now they are capacitance discharge like the cars are running. I hope the attachment helps you troubleshooting.